At the heart of Venice, Teatro San Gallo sits in a 13th century courtyard just beside Piazza San Marco. The theater is home to the show Venezia, which tells the history of the city of Venice through comedy, music, and drama. The lighthearted show uses multimedia to share more than 1500 years of Venetian history and tradition. It is an entertaining way to learn about the city and its role in world culture. And with over 2,000 performances, it is now the longest running show in all of Italy. Though the theater itself was constructed in the 19th century, many features and characteristics of the original palazzo remain. Its interior is classically designed in rich reds and golds. 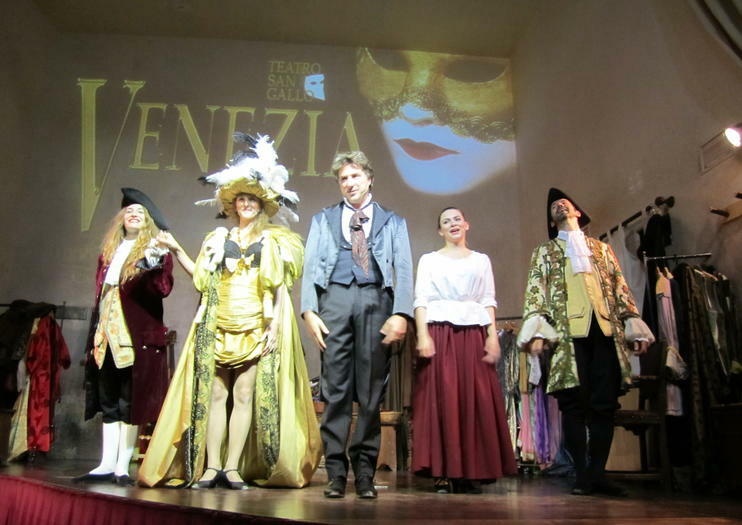 The theater has been updated with a modern stage and sound system, so that visitors may learn the history of Venice with the help of the latest technology. Teatro San Gallo is located steps from St. Mark’s Square at the center of Venice. It is nearby to Bacino Orselo. The nearest vaporetto (water bus) stops are San Marco, San Zaccaria and Rialto. The show Venezia is performed daily in English with translations available. Tickets should be purchased in advance.